Coleraine delivered plenty of festive cheer for the fans as they saw off derby rivals Ballymena United in the big Boxing Day encounter. The Bannsiders came into the game on the back of four defeats, but they were determined to wrap it up with a win over the old rivals. Coleraine's Rodney Brown runs to his club's fans after McGonigle put the home team ahead. And that they did as teenage striker Jamie McGonigle fired in a brace to give the large home support plenty of festive cheer. 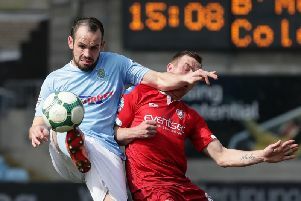 “Derbies are about winning, there are derbies throughout the year, but everyone wants to win the Boxing Day game,” Oran Kearney after the game. “December hasn’t been the best month for us, we’ve had a disappointing couple of weeks results wise, performance wise I don’t think we’ve been too far off the mark. “When I looked at the last couple of games there was big parts of them we dominated but we didn’t score goals in our purple patch. “In Irish League football teams will always get a period of the game when they are on top. “But for me in recent weeks we conceded easy, softer than we have had all season. “Today though I thought we got back to our best and our best is our work ethic and I think when we work hard it gives us a hell of a foundation to get something out of the game. I said to the guys today was just about tweeking a few things and getting back to basics. “Credit to the players I thought they were brilliant today. Probably my only consternation today was going into the last five minutes we weren’t more than a goal up to see it out comfortably. Kearney was delighted the home fans went home with a smile on their faces. “It was massively important for us to send the fans home happy today,” he said. “On days like today you get people through the gate who haven’t been to a game all season. “When you get people like that in to the ground it’s so important to produce for them. You can’t drag them back, all we can do is give them a taste of something and hopefully they will want to come and try it again. “It wasn’t just the win today but the manner of the victory. “I thought we created a lot of opportunities, we had a lot of strikes on goal, so it was a good game for people to come and watch. “We had four or five teenagers starting today. I keep harping on about it, and it’s not because they are teenagers, it’s because they are very good footballers. “We played with a real hunger and desire throughout the team. That is something you can’t maunfacture. Kearney admitted the last few minutes were more nerve wracking than they should have been. “I said in front of the rest of the players after the game both Jamie and James should have made it easier for us ,” he said. “You’re not going to fall out with people over half chances, but there were two or three gilt-edged ones today which you have to take at this level.